This generous size kitchen (14 ft. by 23 ft.) was stuck in it’s 1950’s ranch style. The home owners’ wanted a clean modern update, and a more functional space where family and friends could gather informally. Both were accomplished. We opened the space up by removing most of the wall between the kitchen and family room with its looming grill and brick wall. 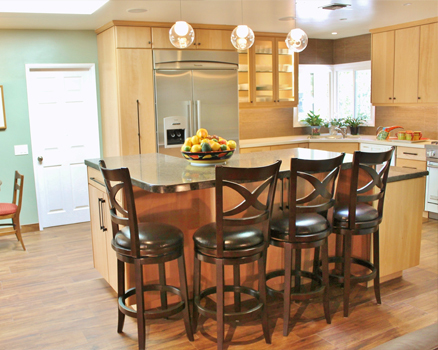 New custom birch wood cabinets add warmth along the perimeter walls with a light speckled Caesarstone countertop. The porcelain tile backsplash picks up the rich red/brown tones and adds silver highlights that complement the stainless appliances. The contrasting brown/black Caesarstone on the expansive island provides prep surfaces as well as an informal counter seating area with base cabinet storage. New wood-grain porcelain floor tiles are the perfect foundation to compliment the warm colors of the kitchen. This low maintenance flooring is great for an active family with dogs, and compliments the look of this kitchen with a modern flair. Lighting was an important aspect of this remodel. A new skylight was created using the hole in the roof from the old grill. We installed new LED down lights in the ceiling, three LED glass pendants over the breakfast bar, and LED under-cabinet strip lights for tasks on the countertop areas. The two reed glass door cabinets also received interior LED strip lights. As you can see, the transformation is functional and timeless. The homeowners’ colorful accent pieces instantly add vibrancy to complete the transformation.